Often overshadowed by other parks in the West, southwest Texas’s Big Bend is a hidden gem of the park system. 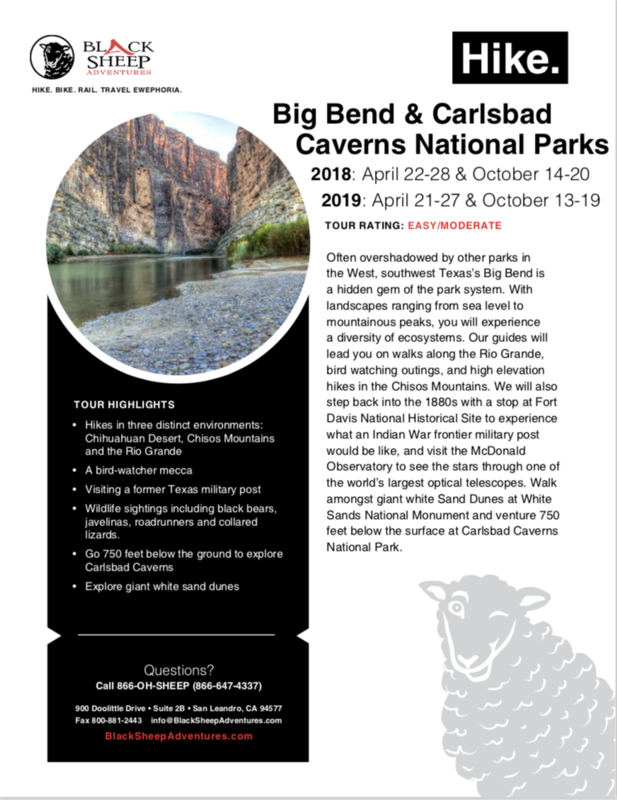 With landscapes ranging from sea level to mountainous peaks, you will experience a diversity of ecosystems on our Big Bend National Park hiking tour. Our guides will lead you on walks along the Rio Grande, bird watching outings, and high elevation hikes in the Chisos Mountains. We will also step back into the 1880s with a stop at Fort Davis National Historical Site to experience what an Indian War frontier military post would be like, and visit the McDonald Observatory to see the stars through one of the world’s largest optical telescopes. Located in the heart of Fort Davis this historic hotel has been in operation since 1912 with period furnishings in each room. Relax in the hotel’s gorgeous courtyard garden or in one of the many rocking chairs watching the world pass by on the quiet streets below. With one of the best views in Texas this hotel is a perfect spot to base our explorations of the surrounding Big Bend National Park. There are no phones or televisions in the rooms as there is so much to explore right outside your door. An icon of western Texas this historic hotel was built in 1930 and has the feeling of a Spanish-colonial building. You will be welcomed by a reception area covered in colorful tiles and their on-site restaurant has a delicious menu featuring local ingredients. This morning we make our way to Guadalupe Mountains National Park where based on weather conditions we will hike a few of the trails around the visitor’s center. Enjoy expansive views of West Texas as we drive to the historic town of Fort Davis established in 1854 and also the highest town in Texas at 5,050 feet. This evening visit the McDonald Observatory for a Star Party and the opportunity to view the starry sky through a number of the observatory’ telescopes. We descend from the mountains back to the Rio Grande to hike along the massive walls of Santa Elena Canyon. The limestone canyon has been and continues to be carved by the Rio Grande and forms the border between the U.S. and Mexico. In the afternoon, we will do one more Big Bend hike possibly visiting Mule Ears Peaks or Cattail Falls. Enjoy dinner just outside the park at the Starlight Theatre featuring live music and delicious Texan food. After another gorgeous sunrise in the Chisos Mountains we begin our drive north passing by the famed fake Prada before stopping in the quirky art community of Marfa where you can take some time to wander the art galleries. We then continue north to the small town of Van Horn and the historic El Captain Hotel for a fantastic farewell dinner.